Pawkets' Feral DPS Guide & FAQ -- Updated for 6.2.3! 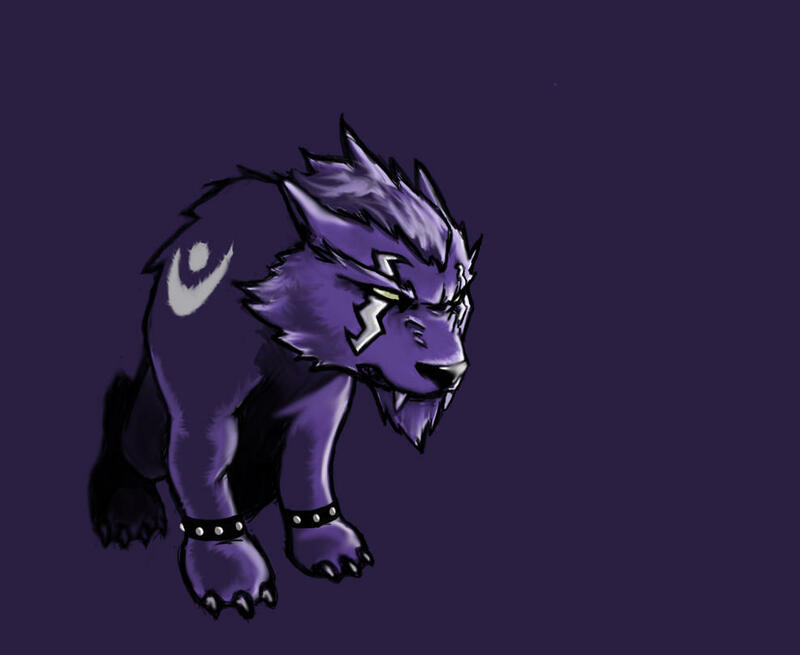 Welcome to my Feral DPS Guide and FAQ! The guide is separated into three parts: a "crash course" section that has all you need to know to pick up feral and be successful, an advanced section for those that want to improve their game to the absolute max, and Frequently Asked Questions (FAQ) section. This guide is currently up to date for Patch 6.2.3. If you have any questions or comments on the content provided in this guide, feel free to leave a post and let me know! If you have any questions or comments on the content provided in this guide, feel free to leave a post and let me know! You can also try asking your question in Dreamgrove chat and somebody may be able to help you out. Which trinket should I use? / Should I break my set bonus? etc. Here I will list the bare bones of the rotation: this is the absolute minimum you need to know to put out decent DPS. Make sure you read the other sections of this post for important details. Tiger's Fury when on low energy. Berserk on cooldown, stack with Tiger's Fury when possible. Refresh Rip in Pandemic window* with 5 combo points when Savage Roar is up. Refresh Savage Roar in Pandemic window. Ferocious Bite with 5 combo points when at 90 energy, Berserk is active, or Tiger's Fury is coming off cooldown. Refresh Rake in Pandemic window. * = Read the uptimes section for more info on "Pandemic window"
In general, you should aim to waste as little energy or combo points to overcapping as possible. With Bloodtalons, finishers should be cast with as much energy as possible without compromising uptimes (see the talent section for more info). First off, in Warlords of Draenor all damage over time effects now have a mechanic called Pandemic. Pandemic allows you to carry over up to 30% of the base duration of the new effect from the old one's duration. For example, if you apply a Rake to a target that has a Rake with 4 seconds remaining already on it, the duration of the new Rake will be 15 (base duration) + 4 (remaining duration, <= 30% of 15) = 19 seconds. It is important to take advantage of this mechanic for optimal DPS, the main takeaway being that all DoTs can be refreshed as soon as they have <= 30% of the base duration remaining. The sooner you reapply a DoT, the less chance you stand of letting it fall off, which means higher uptime and more damage. This mechanic allows for significantly easier maintenance of our bleeds and Savage Roar compared to 5.4. Savage Roar: This should be your #1 concern. When Savage Roar is down or about to end, the only thing you should cast is Savage Roar (or if you don't have any combo points, get one then Savage Roar). If you do this, you shouldn’t have too much trouble getting 99% or higher uptime on it, which is what you should aim for. Savage Roar's pandemic threshold is a bit weird because of the specifics of the mechanic, but just keep in mind that when you're applying a 5 combo point roar you can refresh as soon as 12.6 seconds. The threshold is lower if you're applying a fewer combo point roar, but generally you shouldn't be applying a roar of less than 5 combo points unless is your current roar is about to run out (~3 seconds or less, roughly). This is not to say that <5 combo point Roars are bad, though; you should use however many combo points best allows you to maintain Rip. Rake: You should have this up near 100% of the time just like Savage Roar. Its a CP generator that just costs energy, so when Rake is down or about to end just swap a single Shred out for Rake. Simple. Rake has a Pandemic threshold of 4.5 seconds, so refresh it as soon as its remaining duration reaches that threshold. Rip: This costs energy and combo points so this is where maintenance starts to get a little bit complicated. You always want to cast it with 5 combo points and should aim to have its uptime as high as possible. 90%+ is good, but close to 95% is ideal (given you have full uptime on the target). Rip has a Pandemic threshold of 7.2 seconds, so refresh it as soon as its remaining duration reaches that threshold. Thrash: If you’re attacking more than one target you generally want to keep this up all the time. The more targets, the more important it is, so when you're fighting a large number of targets this should be your top priority after Savage Roar. Thrash has a Pandemic threshold of 4.5 seconds, so refresh it as soon as its remaining duration reaches that threshold. As a feral druid you have two main cooldowns: Tiger's Fury and Berserk; with Incarnation being a third if you choose to spec into it. Tiger’s Fury should be used as close to every 30 seconds as you possibly can; think of it as more of a part of your rotation than a cooldown. It is a very rare occasion where you would consider not using it on cooldown as long as you have something to attack, basically the only time you do this is if you know there’s a big pack of adds about to spawn and you know your TF won’t line up to burst on them unless you save it for it. Like other specializations, Feral's opener is primarily a practical application of the normal priority list: if you understand your abilities' interactions and how to use them then you will understand the opener, and vice versa. Of significant note is when specifically to activate your cooldowns and in what order, as you find yourself in circumstances that typically do not occur during the thick of an encounter, such as a significant threat of energy capping. this sort of setup will sacrifice a small portion of your single target damage to become close to proficient as possible in multi-target scenarios. For weapon enchants, Mark of the Shattered Hand is a viable alternative in dungeon gear, but once you've picked up a bit of raid gear Mark of Thunderlord should pull ahead indefinitely. If progressing on a multi-target focused encounter (as described in the previous section), you may instead consider stacking Mastery rating via Mark of the Bleeding Hollow, flat mastery enchants, and Greater Mastery Taladites. The 2 set is a great bonus for multiple targets, but a bit weak on single target. Thrash becomes a lot more enticing to use since it quickly pays for itself on many targets, and can be applied more aggressively starting at 2 targets. Using the 4 set you should aim to deal as much damage during your Berserk as possible. In your opener, by delaying the use of your Berserk until the GCD following Rip you can fit 3 Ferocious Bites into Berserk for maximum damage. With the 2 set you want to use a finisher instantly whenever Omen procs (making sure you have the energy needed for maximum bite damage). Also note that you can use TF at 60 or less energy instead of 40 or less, which means you can use TF instantly when it comes off cooldown every time except for when you get chain Omen procs. With the 4 set, you want to stop pooling for finishers entirely except to make sure FB is doing max damage. Thrash on Omen of Clarity to keep the DoT up, but don't let it steal BT charges from your damaging finishers. Using Predatory Swiftness at 5 CP instead of 4 if you're not going to use 1 of the charges on Rake, allows you to use thrash more often (otherwise you wouldn't be able to thrash when at 4 or 5 combo points). Tier 17 bonuses are generally worth dropping for Tier 18 bonuses with any combination/item level of items. Bloodtalons and Incarnation are generally the best DPS options for all situations, but Claws of Shirvallah is a good choice for beginners. The other tiers are all generally preference or situational (either due to talents having different strengths or the whole tier generally not being useful). A 3 minute cooldown which stacks wonderfully with Berserk, enables us to take advantage of our Improved Rake perk mid-fight, and allows us to trigger Glyph of Savage Roar; what's not to like? This is what makes us great burst DPS. Never take these talents, there is no situation where they are competitive with Incarnation. They also look far less cool. 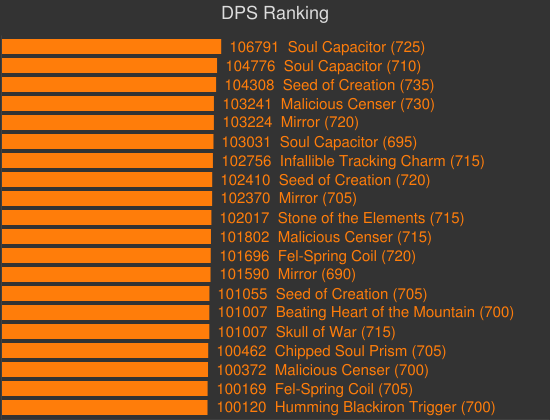 The worst talent in regards to DPS value in the tier, but it also comes with no added complexity. This is a good choice if you feel like you're still learning the basics of the rotation, just remember to give Bloodtalons a shot when you're ready to step it up. This talent is strongest when it comes to sustained damage on 2 to 3 targets. It is mediocre on single target when compared to Bloodtalons, and pitiful on AoE as you don't have enough energy or GCDs to maintain both Moonfire and Rake on many targets. Unfortunately with the buffs to Thrash, Rip, and Rake in 6.2 this talent is no longer the best in even its strongest situation so I cannot recommend it. It is also significantly more taxing to use on 2-3 targets than Bloodtalons due to the extremely excessive timer tracking-oriented gameplay it promotes. You're at 4 or more combo points. Predatory Swiftness is about to expire. Since your finishers are your highest damage-dealing abilities, you want to try to always have a charge for them which using Healing Touch at 4 or 5 combo points allows you to achieve. The other charge can be used to cast a buffed Rake, a Thrash for AoE situations, or simply a Shred if nothing else needs to be buffed. To maximize your ability to reach 4 combo points before Predatory Swiftness expires you should pool energy before your finishers (when possible, don't waste energy or delay Tiger's Fury) which allows you to get a head start into your next combo point cycle. Glyph of Savage Roar and Glyph of Savagery: These two glyphs are mutually exclusive but everybody should use at least one or the other. If you're struggling keeping Savage Roar active (or for levelling or similar activities with high downtime) then Savagery is a good choice but is otherwise intended to be a damage loss. 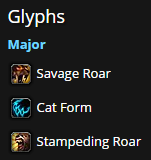 If you're not interested in using Savagery you should take Savage Roar as it is one of the few glyphs we have that gives us a damage benefit, and a rather nice one too. Savagery's damage loss is pretty small (around 4% at most, depending on talents) but finds some optimal use in situations where the druid has a plentiful number of targets to apply Rip to. Glyph of Survival Instincts: Good for fights with frequent, instant, choreographed raid damage. Half duration is of course the big drawback, so if there's little sustained damage of any consequence then this is a good choice. Glyph of Rebirth: If you don't have any Balance or Resto druids in your group you might want to consider this if you find yourself casting Rebirth frequently. If you do then make them use this glyph instead since its far easier for more effective for them to be the one resurrecting. Its probably best to think of the information in this section as "gearing lists" rather than "Best in Slot" because in general piece selection is situational depending on what suites the encounter you're attempting, most notably with the value of mastery. To account for this, the link below has main set that recommends the best all-around pieces, as well as some other useful pieces for various situations. 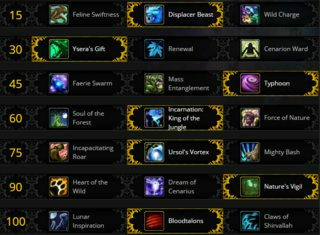 Hellfire Citadel trinkets are situational because of their various strengths and weaknesses so they are not included in the main list. A brief hierarchy can be found after the normal list. Below are two different styles of comparisons intended to give you an idea of trinkets stack up to each other. The 2 trinket comparison is generally more accurate, so you should use it if the trinkets you're comparing are on there, but it is much less inclusive because doing pairs for every trinket available would generate a truly ridiculous number of combinations. The single trinket comparison is less exact because it does not handle trinket (a)synergy at all so it should be used as fallback. Both comparisons are a Patchwerk-style simulation so mastery trinkets are undervalued in most practical contexts. You can apply a stronger Rake via some combination of the above buffs: The cost to reapply a Rake is fairly negligible, and over the duration of that Rake you will net more damage than you would if you use a Shred instead. Note that Improved Rake is active during Incarnation. You can apply a stronger Rip during Tiger's Fury and the target is at or below 25% health: When you refresh Rip on a target that has less than 25% health with Ferocious Bite the damage multiplier on the Rip is maintained when it is refreshed. This means you should aim to stack both Savage Roar and Tiger's Fury (and also Bloodtalons if you are specialized in it) onto your execute Rip as those modifiers will add up to a lot of extra damage over the last few minutes of the encounter. In a short encounter, such as that of a 5 man heroic boss, this can be mostly disregarded. It is important to note that these are the only circumstances where it is a DPS gain to refresh a DoT any significant amount of time before it progresses to its Pandemic level. Rip does not do enough damage to justify trading away potential Ferocious Bite damage prior to execute, Thrash doesn't do enough damage in general, and Moonfire does not snapshot any buffs. For example, lets say you have a Rake on the target that was applied with Tiger's Fury and it is now down to 4.5 seconds remaining. If you were to refresh it at exactly 4.5s (Rake's Pandemic threshold) then the 4.5 seconds of the Rake that is added to the new Rake benefits from the modifiers at the time the new Rake was applied, not the old one. If you instead wait until the 3.0s mark (or even until 0 seconds), this allows Tiger's Fury's damage multiplier to take effect for 1 or 2 additional ticks that it would not have otherwise. Now of course you should be very careful about how you take advantage of this. If delaying the reapplication of the bleed causes the bleed to drop for more than a fraction of a second, then all the damage gained is lost and you would've been better off refreshing normally. This generally it is not a method you should apply with high latency, when you're about to leave the target, or just in general when there's a lot going on and you don't have the attention to devote to such a trivial gain. In most cases the answer to your question will be specific to your own character and you'll have to determine the answer yourself using SimulationCraft (check the next section in this FAQ for information on how to do this). If you're having troubles getting one of these programs to work, feel free to post your question in this thread and someone may help you out. If you do ask for help, make sure you include a link to your armory (or character name and realm)! If you don't do this, 90% of the time we won't be able to tell you the answer for sure. You'll have to download and install SimulationCraft, a free open source WoW combat simulator. There's a great starters guide for getting the program setup and basics on how to use it here, and there's also a guide for how to do some basic comparisons by Mendenbarr here. In this example you're still getting the maximum amount of Berserks and trinket usages, but everything is aligned perfectly for maximum effect. In this case you're holding your 2nd Berserk to go with your last trinket. New thread for a new expansion! Guide is updated for level 100. Let me know if I missed anything that you think I should add. Hi! Thanks and congratulations for the great guide! After a first read, I would say that you forgot to put Bloodtalons in the Snapshotting section. Anyway, when we'll reach lvl 100 it will be really interesting to discuss about advanced snapshotting tactics, which seem to be the real deepness of this spec. Like, for example, if it'll be worth to keep TF for snapshotted Rip and Rake, same for Bloodtalons, tactics to align all the abilities mentioned in the post, thresholds behiond that is better to refresh Rip/Rake with full snapshotted ones, etc. In general the same rules listed in the snapshotting section apply equally with Bloodtalons, but I suppose I could probably make that clearer. I know how to use talents, mainly Bloodtalons, is something that the guide is lacking and that's something I'll have to think a little about how to best to fit it in. 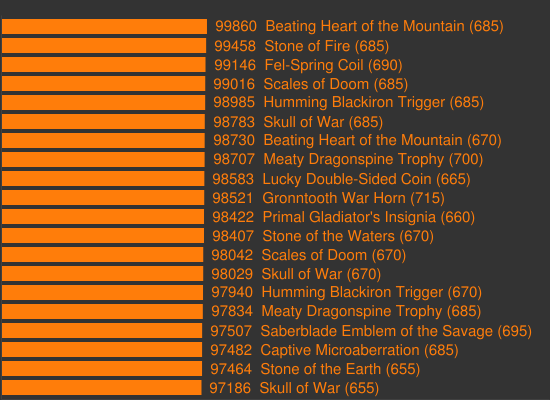 It's not at all difficult to snapshot close to, or every finisher and rake with BT at 100, based on my beta experience. My gut says that it's not worth delaying TF more than a few seconds to snapshot it. It's such a short CD that you could quickly lose several casts per fight doing so. You'll get fairly decent uptime on TF-Rip regardless simply because the uptime on the buff is pretty high. Not sure if sims back up my gut though so take this with a grain of salt. You can see the difference in Rip uptime is actually quite massive (85.7% vs 93.4%) and the MoP profile is actually better geared because its using an epic crafted weapon and engineering helm, whereas the WoD profile is using solely blues. And I agree, you generally don't need to go out of your way to line up anything. The best mindset to approach it with can be related to assembling a puzzle: you know you have a set criteria that you have to follow (don't cap energy, don't waste CP, don't delay TF, don't let bleeds drop) but the order that you put the pieces together (when to spend your energy and when to save it, when to proc Bloodtalons and what to spend them on) is flexible and you want to find the best way to do so. aggixx wrote: In general the same rules listed in the snapshotting section apply equally with Bloodtalons, but I suppose I could probably make that clearer. I know how to use talents, mainly Bloodtalons, is something that the guide is lacking and that's something I'll have to think a little about how to best to fit it in. Yeah I was kinda projecting my thoughts onto what you were saying, heh. There's definitely some gray area in terms of what should be explained in the guide and what can be left to discussion, but generally if something has potential to be discussed repeatedly its probably better to just incorporate it into the guide. I tend to tweak wording here or there based on what people ask even if they aren't intending to give feedback at all just so people are less likely to ask the same question in the future. In the absence of Bloodtalons it doesn't really matter because regardless you'll have the same time (15+ seconds) of Rake benefitting from TF, so the correct answer is whichever wastes less duration. With Bloodtalons its a little different because if you're going to have a charge ready later in the TF, then refreshing early can be close to pointless because you're just going to have to overwrite it shortly after. On the other hand, if that Rake is low duration then refreshing it at beginning of the TF is beneficial regardless because that ensures the TF/BTd rake will be able to last a full 19.5 seconds, in addition to benefitting from that 1-2 ticks of increased damage. Although with Bloodtalons the more likely situation is the Rake you have applied going into TF is already benefitting from BT so there's actually no point in refreshing it until you get BT charges during the TF. aggixx wrote: In the absence of Bloodtalons it doesn't really matter because regardless you'll have the same time (15+ seconds) of Rake benefitting from TF, so the correct answer is whichever wastes less duration. With Bloodtalons its a little different because if you're going to have a charge ready later in the TF, then refreshing early can be close to pointless because you're just going to have to overwrite it shortly after. On the other hand, if that Rake is low duration then refreshing it at beginning of the TF is beneficial regardless because that ensures the TF/BTd rake will be able to last a full 19.5 seconds, in addition to benefitting from that 1-2 ticks of increased damage. Thanks again for the reply. Since TF cd without AoC will be widely longer than Rake duration, I was thinking that applying a TF Rake when TF is about to expire means a slight DPS increase, because after Rake you'll have less TF cd remaining. But I guess that this is compensated by the fact that waiting to apply a TF Rake also means more ticks of the no-TF Rake, since Rake duration (= 1/2 TF cd) is clearly meant to cause an alternation of TF and no-TF Rakes. How do I simulate gear with Simulationcraft now? Previously, different versions of the gear (normal, heroic etc.) had different IDs, but now they seem to have the same. In this case, I am trying to simulate trinkets, but I can't seem to make the TCI understand which version of the trinkets I'm talking about. For example, Whiterbark's Branch has the ID 109999. If I were to select the heroic version on Wowhead, it just adds '&bonus=524' to the ID. You add "bonus_id=524" to the item. Not sure what the simulated value is, but I have to disagree. I didn't have any issue breaking it for higher item level pieces. 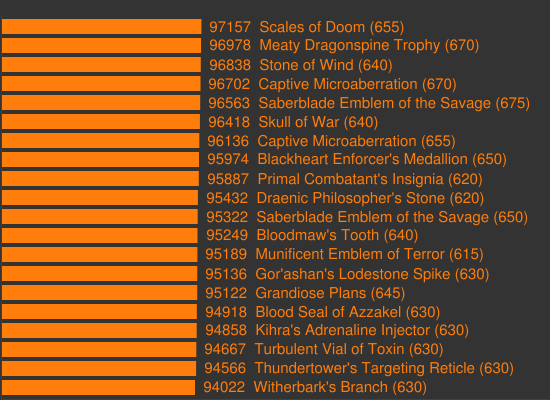 I've updated the trinket rankings with a couple new trinkets: PvP Proc Trinkets, alchemy stone, and the 615 mission trinket. But did i miss something? I remember reading a post for some patch notes that snapshotting isnt possible any more? Did they included again or did they never take it out? Snapshotting of stats was removed, so trinket procs, potions, heroism, and anything else that temporarily boosts your stats does not snapshot. For feral specifically Blizzard left in snapshotting of spec abilities that increase the damage of specific abilities. This includes Tiger's Fury, Bloodtalons, Savage Roar, and Improved Rake. First I'd lilke to apologize for the potential faults in my post : I'm a bad english writer. Secondly, it's my first extension with a Druid so I meaby make mistakes so tell me if I did. I've seen in your guide that you advice to open with Rake (due to Improved Rake), but I wonder if it's not better to open with Shred due to the fact that we will benefit from Improved Rake during Incarnation. So with that opener, the 1st Rake is the strongest as possible and we have a 1st Good Shred (35% up damage and crit x2 from Prowl + Savage Boar). I know it's meaby not a strong improvement but tell me if I miss something. I just want to understand my new class. and reducing the target's movement speed by 50% for 12 sec. Being stealthed increases damage by 35% and doubles critical strike chance. Damage increased by 20% against bleeding targets. Also if your second Rake is the strongest (ie with BT, and TF during Incarnation) it's going to be a 19 second Rake. Lucky Double-Sided Coin got nerfed, reduced passive critical rating to 147, down from 220. The agi proc seems to still be the same however.